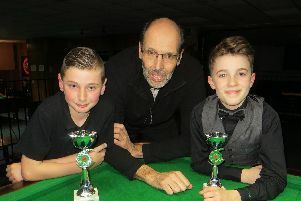 Harry Wilson did the double in style with Monday Junior League success at Waterlooville Sports Bar, writes Tim Dunkley. The 12-year-old talent won the handicapped tournament on presentation day to add to his division one title. He gained a decisive snooker on the pink to beat first-time finalist Billy Reid. Owen Jenkins overcame Josh Richards in the Plate final. Following the tournament, which attracted 10 entries, club owner Suzy Wilson presented the trophies for the second season. League organiser and world snooker coach Tim Dunkley praised the players. He said: ‘We are all really pleased with how this league is growing in numbers and strength. Meanwhile, defending champion Samuel Laxton won the top group in the Wednesday Junior League and edged up to third place in division one. The 13-year-old is one point shy of second-placed Zak Truscott and three adrift of league-leader Dean Russell. Tom Shuttle topped the second group and climbed to fourth place. Former Cuestars bronze tour championship play-off winner Callum White was undefeated in the third group and recorded the day’s highest break of 23. Billy Reid heads division two. Antony Terroni and Tyler Mack are tied at the top of division three. And Zak Amey, one of the new recruits of the Junior Pool League, is impressing organisers. In only his fourth week, the nine-year-old won the nine-man round-robin group and climbed to sixth place in the table. Jayden Brookes has taken over top spot with one week left. Keira Hiscock moved up to third.